Hardly a notice about the stockmarkets does not use this metaphor. The bear synonymous for falling markets, the bull as a symbol for rising markets. There are several storys how this metaphor became so popular among the brokers and the public. The most common and accepted version, is that a Spanish poet watched the scenery at a stock market in Amsterdam during the 16th century and was reminded of a special fighting attraction in South America between bulls and bears. The bear hits with his paw downwards and the bull pushes with his horn upward. Now one would assume, the utilization of this metaphor in the daily language of the elite class of pinstripe bankers would have caused a positive image for the current generations of both species. Unfortunately this is not the case for the bear, because falling markets are not only a fact., but they additionally mean losses and pain for many people. This difference in image is not justified in both the real world and stockmarkets. Which child would like to change its teddy-bear for a cosy bull. And most men would prefer a meeting with a bear, after watching pictures of torreros being lifted up by a bulls horn between their big toes. Importantly today, modern financial marktes offer a wide range of products and strategies to gain a positive performance both in bull- and bear markets. But like in arts only a few experts are able to achieve an outstanding performance. Watching the portraits of the bull and the bear from Alexander Durek, you feel intuitively the presence of such an outstanding performance. Art here derives from its original meaning: skill. Painting portraits is an established part of the arts since centuries. 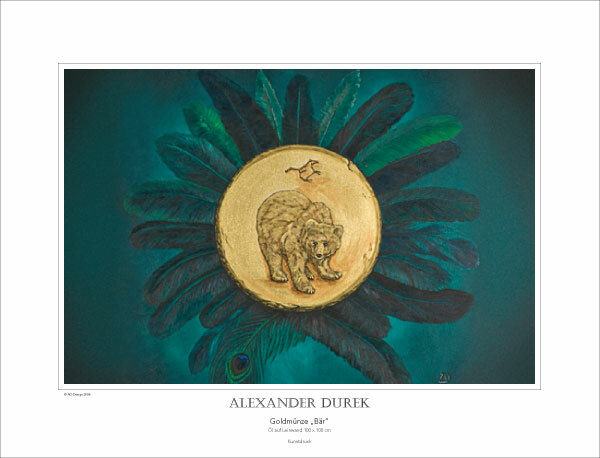 Alexander Durek´s methods and pieces are unique, as he has succeeded to use the highly desirable element gold with its mystical meaning in an innovative way. Recently ethical compliance and aspects have gained importance in many financial products. Now Alexander Durek offers in its kind a very interesting symbiosis: The material world on the one hand and the esthetical on the other. One of the fortunate impacts of Alexander Durek´s masterpieces is, that there is no difference in image between these two species anymore and people can enjoy and succeed with both.